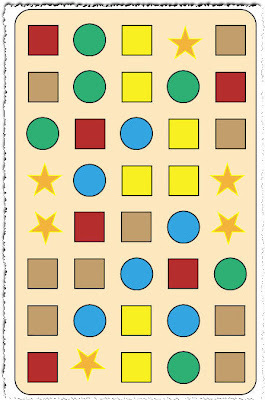 Assume that you have a mix of circles, stars and squares pretty much like the image shown below. Now, let's say that you want to change the color of all the stars from amber to red. One way to do this, would be to select all the stars with the selection tool one by one while holding down the SHIFT key, and change the color to red. 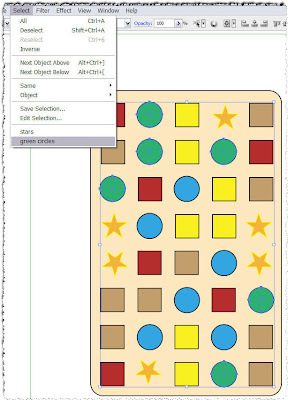 Instead of doing just that... let's have a look on a more clever way to work and see how you can save your selections so you can quickly reuse them at other stages of the design thus saving you time. 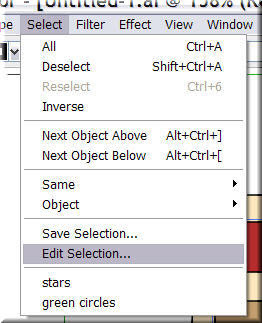 So select all the stars, anyway you want and then go to the Select menu and choose Save selection... Now give a name to that selection. I used stars. 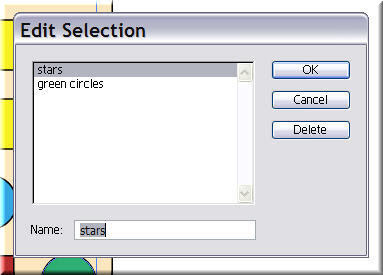 Great... Deselect the stars, and repeat the same procedure with the green circles. Name this second selection green circles. Now, if you did everything correctly, by clicking on the Select menu you should see your two saved selections at the bottom of the drop down menu. So now let's say you deselect everything. 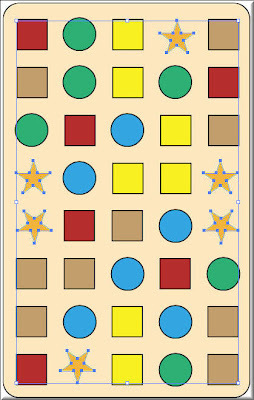 if you want to change the stars fill color, just click and load the stars selection you created and saved earlier. 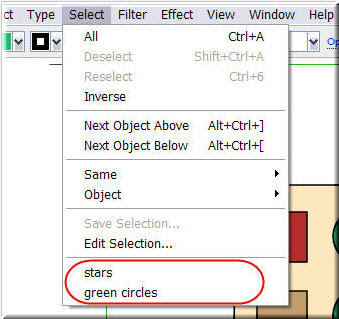 Do you perhaps want to change the green circles stroke? Piece of cake... Load the green circles selection and make it e.g. thicker. Another cool characteristic of this feature is that if you save and close the file and come back a couple of days later, your selections will still be there for future reference. 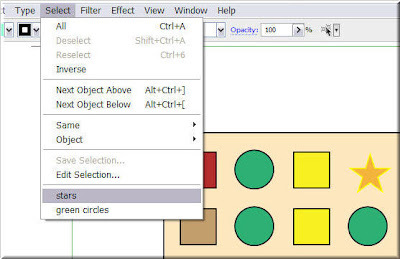 If you decide you no longer need one of the selections, you can easily click on the Select menu and choose edit selection. 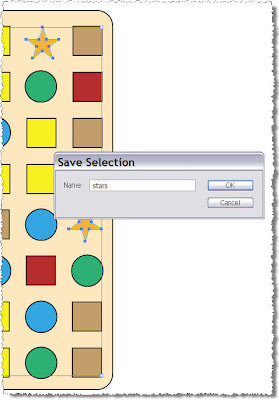 Click from the list on the selection you no longer need, press Delete and OK. The selection is gone. 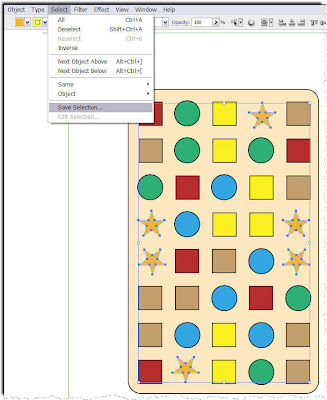 When working with complicated designs that consist of many objects and shapes, saving the selections you frequently use, can prove extremely useful and saves you precious 'creative' time. Helps me a lot, thanks. Is there any way to give your selections shortcut keys? So instead of Clicking Select > BlueSquares1, I can just type Alt+S > '2'? I would like to know if anyone can help me in choosing a Photo shop CS3 tutorial ie: how the hell does it work? ?, can some one recommend for a beginner easy to learn interactive DVD. where to purchase? in Australia or the USA, ebay? photographic shops? etc. Nice work.i really like this. CS4 and CS3 are they the same?. I am confusing what to use. Is it more comfortable if I will use the old one? This is just fantastic, I just love it. We need more blogs like yours. You have great information and it’s really useful. I bookmarked this site and will come back. Lovely article post about saving selection during creation.I liked. This is one of the most real blogs I have ever read. Nothing overcomes good first hand encounters on subjects. Thanks for being true about this. Thats a great idea..There are lot of information here that are very useful fo us. Thanks a lot for this..
Great tutorial. I adore your work. It's very helpful.